Indications: Prescribed for the treatment of gastroesophageal reflux disease and ulcers. Summary Recommendations: Axid AR stops the production of H2 histamines responsible for the production of stomach acid. The medication may interact with other medications or render other medication ineffective so tell your doctor about all medications (prescription and over-the-counter) you are currently taking. Never start taking a new medication without first consulting your physician. Always take Axid AR as prescribed even if your symptoms resolve before your prescription is finished. General Precautions: Common side effects associated with Axis AR include dizziness, headache and diarrhea. Severe allergic reactions have been reported. If you suffer hives, rash, trouble breasting or a feeling of tightness in the chest, seek medication attention immediately as you may be having an allergic reaction to Axis AR. Due to potential dizziness, do not drive or operate machinery if you feel dizzy. This is especially important when you first start taking Axid AR. Elderly patients may be more susceptible to side effects. Children under 12 should only use Axid AR under the watchful eye of the prescribing physician. Tests have not been completed on children under the age of 12. Effects While Trying to Conceive: Based on animal studies Axid AR has no effect on fertility. No human studies have been completed. 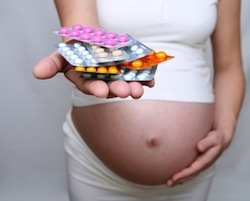 Effects on Pregnancy: Axis AR is in pregnancy category B, which means the drug is considered safe for use during pregnancy. Animal studies have shown no negative effect on pregnancy, but no human studies have been completed. The current formula of Axid AR has been on the market for less than 10 years. There are other drugs in the same category with longer approval histories and more comprehensive data in terms of pregnancy safety. Safe During Breastfeeding: There have been no reported side effects in infants breastfeeding to mothers taking Axis AR. After taking 150 mg of Axis AR every 12 hours for five days, breast milk samples were drawn from three women. The samples showed maximum excretion of the drug as 137 mcg over a 12 hour period. This is less than a tenth of a percent of the maternal dose. H2 blockers are known to increase prolactin levels, which could lead to higher than normal serum prolactin levels or increased, excessive or spontaneous milk flow. Neither of these conditions has been reported in breastfeeding mothers taking Axid AR.